Nowadays, the growth of GPS technology which integrated in smartphone mobile are being used as navigation and location detection of an object makes the studying material of GPS technology interesting to be learn thoroughly. Especially looking at the system which can be widely used everywhere and anytime whenever in need. However,the lack of accuracy when determining a moving object while object are within an area , makes the GPS technology no longer provide an added value for its user. 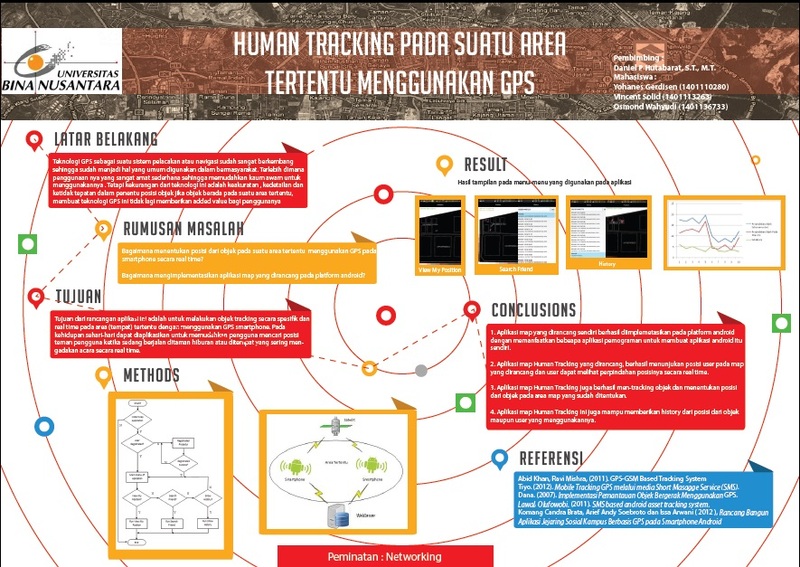 The purpose of this Human Tracking research are to perform an object tracking specifically and in real time on a specific area using GPS smartphone so that it can provide an added value for its user. This system are generally consist of 4 main core as transmitter, Satelite, Webserver, and Reciever. Smartphones are functioning as transmitter and receiver for determining position of an object. Meanwhile, webserver will be function as storage that save the coordinate and location from transmitter and receiver and satellite will be functioning as a coordinate transmitter. Coordinate data which have been receive by transmitter (Smartphone) will send it to database on webserver via 3G. If there is an request for tracking, then the data which have been sent to webserver will be transfer to receiver via 3G. There are 2 result of this experiment, to determine the accuracy of this application in determining position of an objects,it takes about 9.71s or an object should be moving about 9.08m with the fault of this application approximately 4m. This designed application could track an object in real time within a specific area which have been determined. Keywords : GPS smartphone, tracking, specific area, real time.